You fly off from London’s Heathrow and land in Peru with your crew and cameraman, heaps of luggage and technical equipment. Your mission, should you choose to accept it, is to trek the best part of the Amazon rainforest, via mountains and forest, using the river as your guide. You will meet and play guest to various indigenous groups and villages of people along the way. You will discover all sorts of interesting things, like how chewing cocoa leaves helps relieve altitude sickness, and that it releases cocaine when wrapped up in charcoal. Well that’s just what explorer and film maker Bruce Parry did, back in October 2007 for the filming of the documentary Tribe. I’ve always held a fascination about the Amazon rainforest, that vast deep mysterious world of nature and wildlife. Undisturbed indigenous groups of people who have never had any contact whatsoever with the rest humanity, living very different ways of life – ways that would probably seem quite alien to most. Bruce and his team spent time with various tribes and participated in their ceremonies and rituals in order to gain meaningful experience and insight; some of these practices were physically demanding and spiritually influenced, like the one involving a shaman with the Achuar people who drink a particular forest vine and then vomit routinely before experiencing some sort of supernatural ‘vision’ – amongst other interesting things. How about a ceremony that requires you to gather stinging ants in order to self-administer stings to your own body – during which, the locals seem to pick some of the most painful parts of the body to target their stings. The ritual is mixed with music and dance – amidst the pain. In the chapter ‘Gold Fever’ Bruce highlights some of the lesser well known ethical concerns around the mining of gold (most gold is used to produce jewellery for human adornment around the globe). It was interesting to learn that gold mining in the Amazon equates to the destruction of the Amazon forest – historically, Europeans “first navigated the river in a vain quest for the promised ….Amazonian kingdom of gold”. Iron, diamonds, tin, copper and uranium are also abundant throughout the Amazon – Bruce suggests that Brazil alone could rake in 50 billion dollars annually from it’s rainforest minerals. pg. 90. Is mining worth it, just for rings and necklaces? Some argue that the deforestation of the forests from farming causes far more devastation than that from gold mining and would also say that gold mining from indigenous people is relatively harmless to the environment compared to ‘big corporation gold mines’ that basically take wealth from the Amazon back to Europe and North America – “who they (the Amazon indigenous) view as colonial exploiters”. Understandably, there are mixed feelings amongst those who live in the Amazon – they understand the importance of preserving their environment, but many also feel that the forest’s minerals should be exploited in order to lift and benefit their nations and people; ‘Destruction in the name of development’. Bruce highlights that there are practices of slavery in the Amazon, forced labour to pay debts, gang problems and battles over land ownership. Visitors from outside the Amazon have brought with them diseases which (in the Western world) are easily treated, but prove to be deadly epidemics amongst people in the Amazon. At the time of writing this book, Brazil was the world’s largest supplier of beef to the rest of the world – including the United Kingdom. Interesting fact! 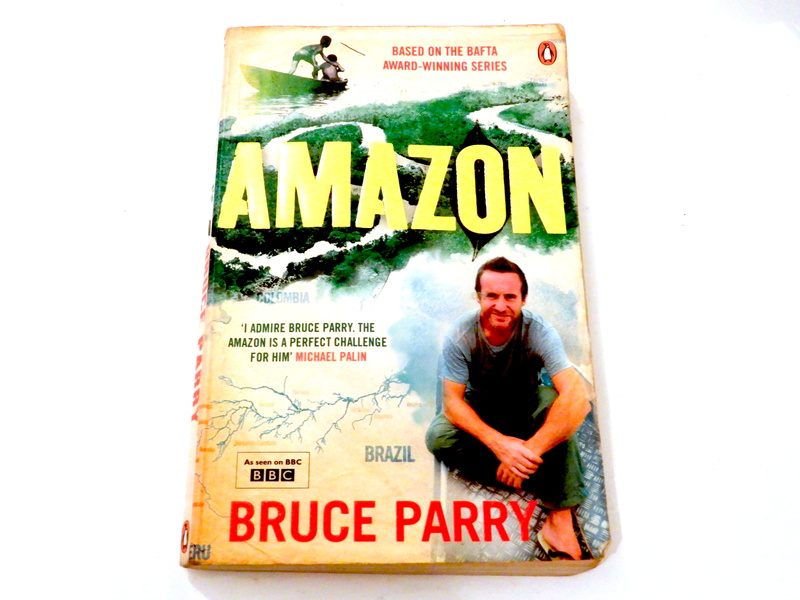 In his epilogue, Bruce shares a sentiment that I have found myself saying many many times “some of the poorest people in the world are among the most generous” and it’s a very humbling thing to experience – leaving you questioning yourself and the ways and habits of people around you – the enormity and ‘normalisation’ of greed and selfishness in our everyday lives becomes embarrassingly vivid. I came across this book completely by accident in a bargain bin in WHSmith for £3. After reading it, I’m keen to watch the filmed documentary series from start to finish. I would accept the challenge in a heartbeat! Actually, I went down/up the Amazon river on a cargo ferry for a few days back in 2011. Reached the tri-border: Peru, Colombia, Brazil – it was incredible and will write about it after my Bolivia posts. Fantastic – love that energy! I look forward to hearing about your Amazon travels – it seems like an intriguing one 😊 the sounds, wildlife, views, tribes, and lure of the river altogether – sound enchanting. Amazing – you really have travelled- those memories and experiences are priceless. Travel is my lifestyle choice.